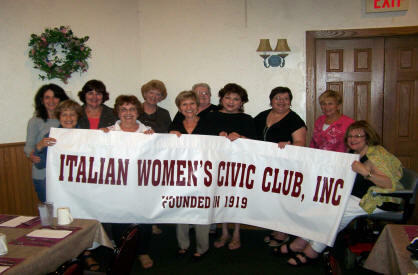 The Italian Women's Civic Club (IWCC) was organized in 1919 by 20 civic-minded women who joined efforts to educate women voters in citizenship, study civic concerns, and work for the beautification of Rochester. They soon discovered that education played a key role in fulfilling these goals. Since 1924, IWCC members have volunteered their time by participating in a variety of local events and functions. During World War II, they sold war bonds and stamps, volunteered as nurse's aides for the American Red Cross and assisted at the U.S.O. Members also collected books and records for Italian prisoners of war and sent food, clothing and financial aid to Italian orphanages. Picnics were held for widows and orphans of Italian heritage and the elderly. Humanitarian efforts were directed to the people of Italy and Hungary during the Florence Flood Relief Campaign and the Hungarian Relief Fund. Locally, during that time, members provided economically disadvantaged families with the necessities to survive, and initiated projects that benefited many local charities. Since the early 1900’s many women have taken the leadership role as President of the IWCC to promote philanthropy and bring about positive change for the Italian community.